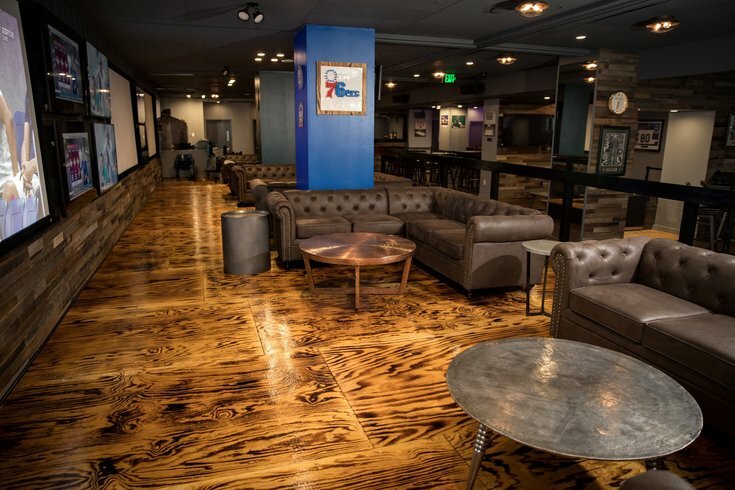 The lounge area at Rittenhouse sports bar Stats on 17th. This weekend Philadelphia Eagles fans will wake up a lot earlier to watch the team as they face the Jacksonville Jaguars in London's Wembley Stadium on Sunday. Though it's technically an afternoon game there, that translates to 9:30 a.m. here in Philly, which begs the question: Where to go watch the Eagles on Sunday morning? In honor of the breakfast-time kickoff, a number of bars in Philly will offer food and drink specials for those early risers ready to watch some football. Check out some of game day's best deals below. 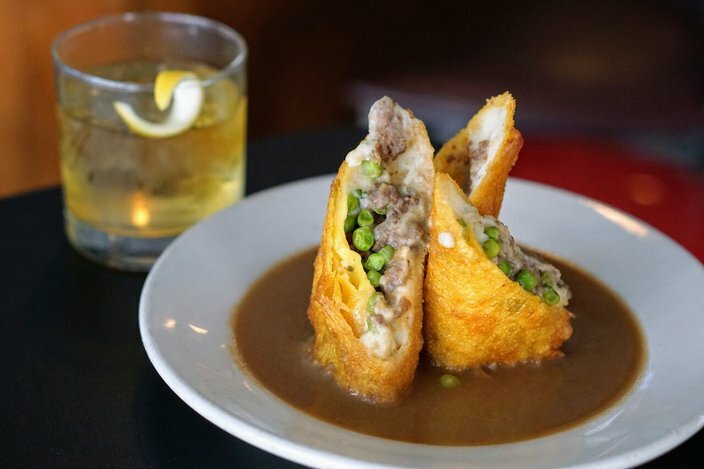 Shepherd's pie egg rolls at Nick's Bar & Grill are $8 this Sunday, Oct. 28. Nick's opens at 9 a.m. to serve some English-inspired fare for the game, including $8 shepherds pie egg rolls and $10 fish and chips. What Eagles fan doesn't want fried cod for breakfast? They will also be offering a full English breakfast for $10, which will go down nicely with $6 beer-mosas, $10 Miller Lite buckets, and $3 domestic drafts. 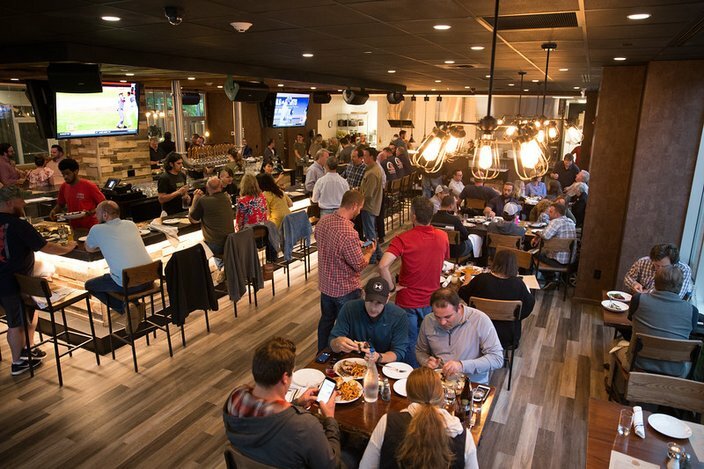 The neighborhood's newest sports bar opens at 8:30 a.m. Sunday, offering a special through noon, which includes chicken and waffles, chocolate chip pancakes, and stuffed fruity pebbles French toast, plus the normal menu that starts in the afternoon. In addition to $5 bud light, you can get $6 green tea shots, $6 tea cocktails, $5 spiked seltzer, and a $10 basement bucket for a fruity rum cocktail. Tradesman's opens its doors at 9 a.m. and will show the Eagles game on a 10-foot media wall that's bound to wake you up in time for kickoff. There will be $5 drafts of select craft beer and cider, a yet-to-be-announced Eagles-inspired beer, and $6 honey bourbon shots. Tradesman also will have several $8 food deals to keep you from completely passing out. 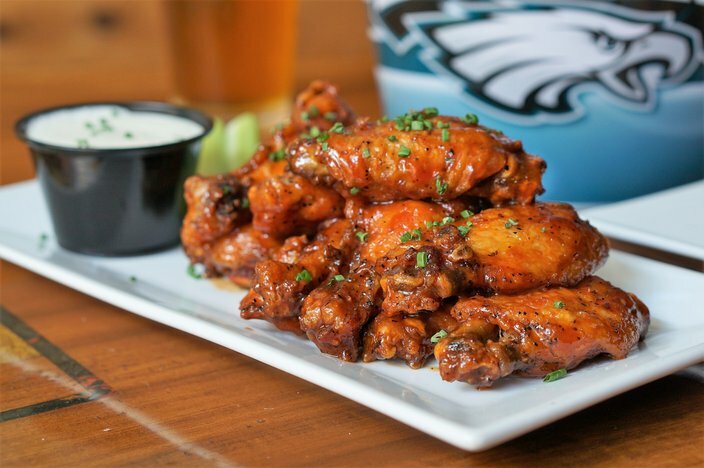 Wings at BRU Craft & Wurst are discounted for the Eagles' London game. The beer hall opens at 9 a.m. with $5 drafts, including BRU's own Eagles-inspired Oktojawn, as well as $6 whiskey shots and bourbon punch. For eight bucks you can score the poutine-like Brü fries, wings, or cheese curds. 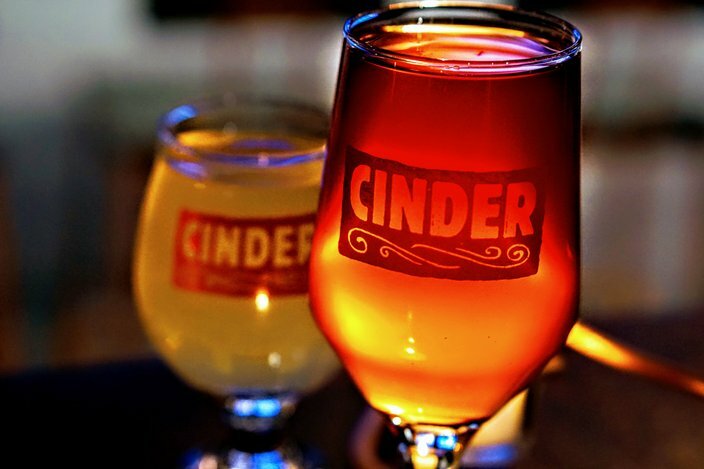 Some ciders and beers at Cinder are $5 for the London Eagles game. Cinder opens at 9 a.m. to serve you the breakfast pizza you need: Football fans can indulge in four different pies for $10 each, along with $8 wings and a $6 bourbon cocktail named after Eagles center Jason Kelce. There also are $5 cider and beer deals. Eagles fans can arrive at O'Neals as early as 8 a.m. for mimosas and bloody Mary's for just $3.50 each, plus ultra cheap pints, drafts, pitchers, and buckets of Miller Lite. O'Neals will serve breakfast through 3 p.m. and offer more specials on the day. Urban Village Brewing Company offers breakfast pizza and crostatas. The brewery in the Piazza will open at 9 a.m. to offer $3 drafts of all its beers, including the Super Bowl LII-themed Fiddy Two IPA. The spot will be serving its new brunch menu, including $15 brunch pizzas and crostatas, plus $10 breakfast fries topped with bacon, hollandaise, and a fried egg. It's happy hour pretty much all day at Landmark in honor of the early Eagles-Jaguars game on Sunday. Appetizers will be at discounted prices until doors close at midnight. Some 16-oz. drafts will be $3, as well as $4 sangrias and $5 Landmark lemonade. 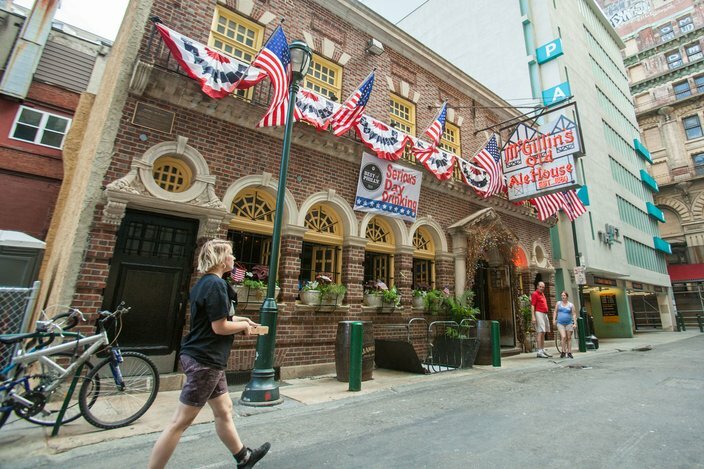 America's oldest continually running bar is not slowing down for the morning game. The place opens at 9 a.m. for a Kegs & Eggs breakfast, which includes the full brunch menu, including $3.99 bloody Mary's, bellinis, and mimosas until 3 p.m. You can also get the $5 Super Mug, which gets you $2 refills of Bud Light for Eagles games through the rest of the season. Red Owl opens at 8 a.m. and will serve a full English breakfast for the game, including eggs, sausage, bacon, tomatoes, beans, and toast for $16. You can also get Pimm's Cups for $10. English breakfast at CO-OP Restaurant & Lounge is $13 this Sunday, Oct. 28. CO-OP opens at 7 a.m. every Sunday, and for the Eagles game will be offering its own take on the English breakfast, plus coffee, for $13. From 8:30 a.m. to 12:30 p.m. join Wissahickon Brewing for a Bird Gang Brunch. The brewery will host the PaperMill food truck and be serving beer-mosas along with its craft beer drafts. For Eagles fans looking in need of more of a wake-up call, there will also be Rival Bros Coffee Whistle & Cuss Blend cold brew coffee on tap as soon as the place opens. Vesper is opening early to serve bottomless brunch for $25 during the Eagles game. The deal is going at both its Center City and NoLibs locations. If you're dying to go out for the game but don't love sports bars, P&K is perfect for viewing whilst eating a delicious breakfast. The place is opening at 9 a.m. and will serve special English-themed brunch specials – with a Philly twist – for the day, including Welsh Rarebit (with Yards provolone fondue), an open-faced scrapple sandwich, spicy mustard wings, and smoked beef hand pie. 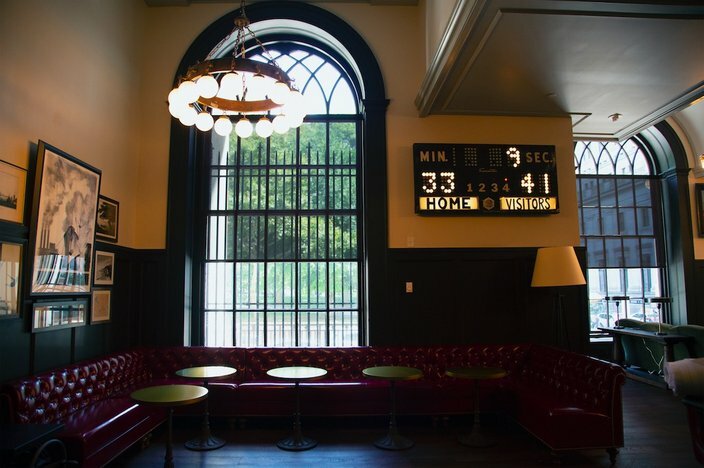 The waiting area at PJ Clarke's new Philadelphia location. That score looks familiar. 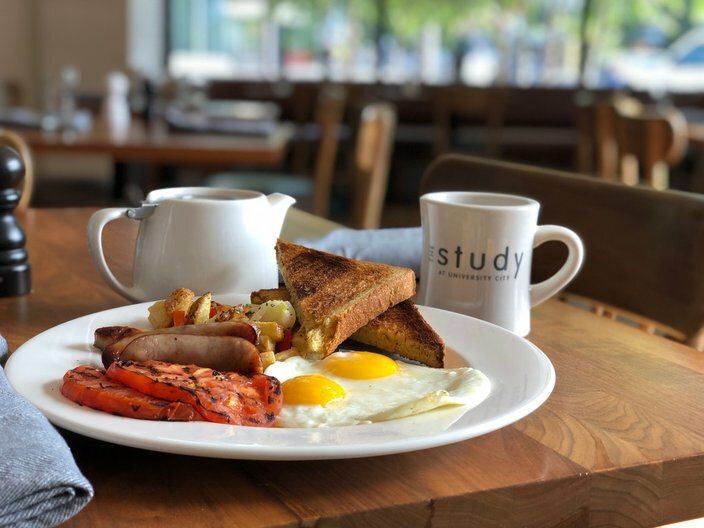 The new bar and restaurant in the Curtis Center is launching its brunch offerings this weekend, opening the doors at 8 a.m. for drinks and 8:30 a.m. for food. Head there for the Eagles game and you'll be among the first to try the new menu, which includes lemon ricotta pancakes, skirt steak and eggs, and a $15 classic breakfast special. The London game is going to be a big affair at Plough and the Stars, where former Eagles players, cheerleaders, and Swoop are scheduled to make appearances. The full brunch menu will also be available, as well as drink specials including $3.50 Miller Lite drafts and bottles. Doors open at 8:30 a.m. The Cajun bar and restaurant has plenty of specials in time for game day, including $13 steak and eggs, $14 kegs and eggs (including a main course, side, and draft beer), as well as discounted Bloody Mary's, $5 shots of Jameson, and $2.50 for PBR, Yuengling, and Miller Lite.